The Chicago Vintage Mustang Club is the First Vintage-Only Mustang Club in the Chicago Area. We use the internet exclusively to communicate, using an email group to send announcements and an internet web forum for day-to-day topics. Our membership list has grown steadily — passing 250 members in 16 years! Membership is FREE, and allows you to keep up to date with all of the shows, cruise nights, picnics, and tech meetings organized by the club. Tech Meetings? Yes—that’s right! We get together to help each other with our cars—everything from upholstery to engine installations. If you are interested in joining us, please send an email to us at: [email protected] or check out our website at: www.chicago-mustang.com for more information. 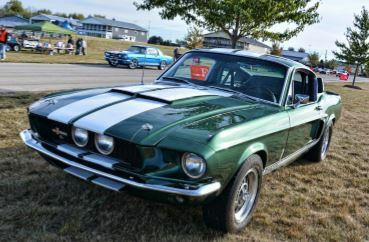 We hope the Trackside Mustang Shelby and Ford Show will become the premiere Mustang event in the area for years to come. The unique combination of Car Show, and Parade Lap track time for our participants should make for a day that everyone will remember!